This large jack knife has a finely crafted grooved laurel leaf-shaped blade, which is designed as a hunter's tool for skinning, it has a handle with a spring, shaped sides in light mouflon horn and engraved brass guard. Small wheels of different sizes and shapes, traditionally used to cut and refine pasta and sweets: culungiones, sebadas, orillette, caschette, each of them is refined with a specific tool, hand-made with great skill. This hand-made jack knife features a classic myrtle leaf shape. The artefact is characterized by a pecurial mutton-horn handle embellished with diamond-shaped motifs of different colours and a brass frame. This kitchen set is hand-made and includes two fixed blade knives to slice meat and a mincing knife. 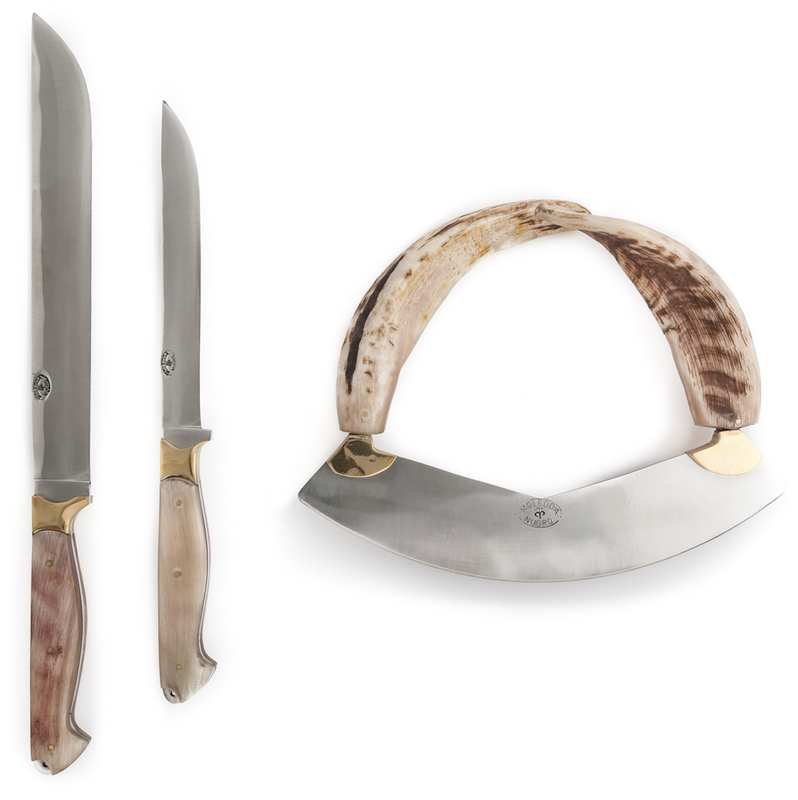 The minimal design of the knives is underlined by the complex craft of the mincing knife, that features mutton horns mounted in their original shape. Being a refined and skillful cutler, Gino Moledda has learnt his craft from his father, who also left his the workshop in the city centre of Nuoro. He manufactures all types of traditional nuorese and barbagia knives and creates table versions upon request, using horns, mother-of-pearl and silver. His main feature are the wheels for the preparation and decoration of fresh pasta and traditional sweets. He also continues the family business as a knife-grinder, the only left in Nuoro and one of the few in Sardinia, working mainly for sector-specific clients which requires high performance kitchen tools. Since 1988, he has been participating in the most prestigious Craftsmanship Bienniales. In his workshop, Gino Moledda makes kitchen knives, manufactured with following a precise design and using fine materials, original and inspired by tradition. 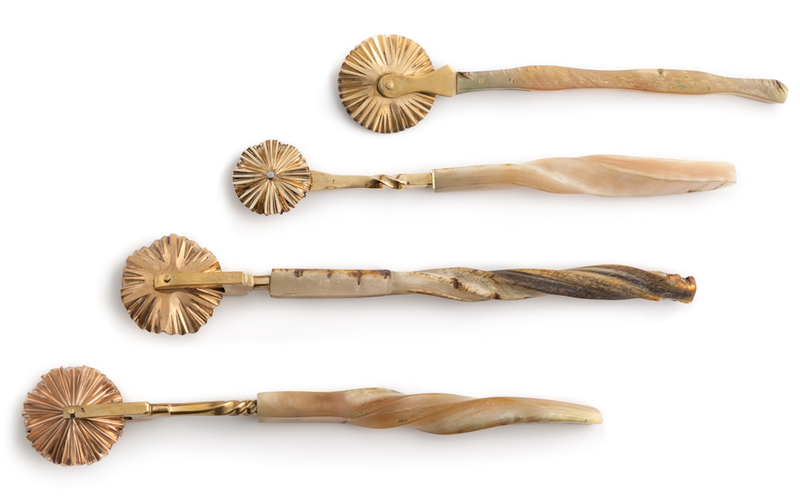 These works of art feature handles made of buffalo and muffloun horn or mother of pearl, with a gold or silver ring and often damask steel blade. These precious and highly professional artefacts are targeted to customers sensitive to the unique taste of top quality craftsmanship. All knives, even those featuring refined and precious materials, are highly functional and efficient. For the realization of the blades, the craftsman usually employs stainless steel, that does not oxidize and keeps a cutting edge, while the handle is made of ram and deer horn, either polished or rough.